This item requires special truck freight shipping from our warehouse. To order and get an accurate shipping quote, please call us toll free at 800-533-2210. The Atlantic British custom rebuilt 4.6-liter Land Rover BOSCH long block engine (Part # 9257DRL1K) includes remanufactured and installed engine heads, new rocker shaft assemblies, as well as a timing front cover with an oil pump and much more! It offers superior remanufacturing for a quality engine replacement that fits Land Rover Discovery Series II 2002 - 2004 vehicles. This 4.6-liter BOSCH engine replacement is designed to last and solve common issues found with stock Rover engines. Our unique rebuild process corrects sleeve pressure seal problems that caused failures with a number of original equipment engines. The blocks in our engine rebuilds are parallel-decked to the main bearing saddles, ensuring uniform compression across the entire block and more even and consistent idling. Our specially-designed and flanged sleeves create a positive seal between the flange cylinder liners and the engine head, which prevents compression gas leaks and sleeve movement. Additionally, each crankshaft is polished to ensure no imperfections. Our rebuilt long block engines also use a specially-manufactured, original-style cam bearing set that improves lubrication to the front of the cam shaft. Pre-Installed Engine Heads and Components Included! This engine is setup with precision-installed engine heads, new rocker shaft assemblies, tappet assemblies, push arms, rods, single-use head bolts, a water pump, timing front cover with oil pump and a refurbished oil pan. With these components pre-installed, you'll save you time and labor with heads already torqued down to exacting specifications, no valve job required! Note sure which style of engine you have? Buy with confidence! Each 3.9, 4.0 and 4.6 remanufactured engine comes with a 12-month, unlimited mileage warranty. See our Warranty & Installation Instructions for full details. Each engine is packed and shipped in a specially-designed rotomold crate that makes returning your old core a cinch! *Note: For a core refund you must return your old engine core complete with a set of heads in engine crate provided. Core refunds are subject to review and may be waived in part or fully if engine returned is not the same size and style engine that was purchased or if core is damaged and/or not able to be remanufactured. For more details on core refunds, visit our Core Refund Instructions and Information Page. Our Remanufactured Engines - An Overview: Finding quality replacement engines for the Land Rover Discovery, Defender, Range Rover Classic and P38 Rover models has not always been an easy task. Our Engine Rebuild Program offers high-quality 4.0 and 4.6-liter remanufactured BOSCH and GEMS engines - all with improved design and function over the Original Equipment engines! Watch as we walk through the lengths we go to in order to rebuild the highest quality engines. Questions about this video? Call us at 1-800-533-2210 or contact us live chat. 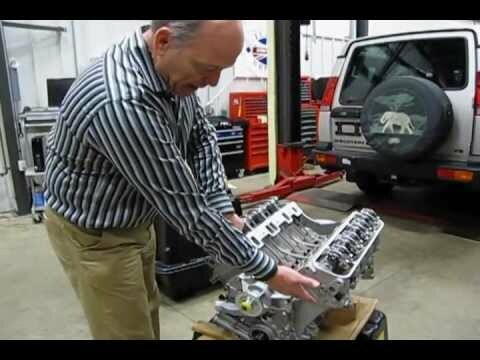 Atlantic British Ltd. Repair and Maintenance Academy How-To Video Series: Watch Doug, our Land Rover Master Technician, install ARP Engine Head Bolts using Kit # ARP4301 on a 4.0/4.6 Engine.